Sonia joined SAGE in 1997, and has held several roles across Finance, HR & Admin. 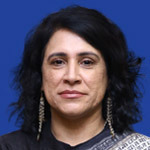 Currently, working as Director, Finance & Commercial Operations she is responsible for the Finance & Commercial functions as well as Customer Services and warehouse functions for the Sage India business. This includes managing all Legal issues pertaining to Company Law, Labour laws, Tax and Statutory Compliances with Local Indian Laws. Before joining SAGE, she worked for three years with Somani Group as Head of Finance in the manufacturing industry. She has also worked on an independent consultancy basis for Export Houses. An active member of the IMA (International Market Assessment India Pvt Ltd.) and Publishing Associations of India. She is also a fellow member of the Institute of Cost and Management Accountants (India).